Matt began taking photographs while guiding on the Middle Fork of the Salmon River. His original intent was to capture and convey the beauty of the central Idaho Wilderness and share the images with family and friends. This effort eventually evolved into a coffee table book of photos and essays on the Middle Fork of the Salmon. Published in 2002, Impassable Canyon is a collection of Matt's finest Middle Fork photographs. Accompanied by essays, narratives, and interviews the book offers the complete Middle Fork experience for anyone who has floated, or hopes to float through these beautiful canyons. As a white water rafting and backcountry ski guide, Leidecker became intimately connected to the central Idaho landscape. In an effort to share his knowledge with a broader audience, he created Idaho River Publications and began writing guidebooks. 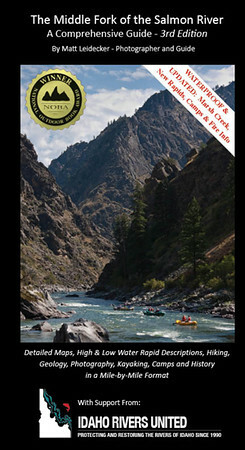 His first guidebook to the Middle Fork of the Salmon River won the National Outdoor Book Award in 2006. All of Idaho River Publication titles are printed on durable, waterproof paper and include many of Leidecker's stunning photographs. Learn more at the Idaho River Publications website. The Middle Fork of the Salmon River - A Comprehensive Guide. The first edition of this guide was published in 2006. By then, Leidecker had been guiding for fifteen years on the river and saw a need for a more thorough and complete guidebook for the “Crown Jewel” of Idaho’s Wild and Scenic river system. The book has sold more than 12,000 copies and is currently in the 3rd edition. In addition to the technical rapid and campsite descriptions, the guidebook includes essential information on hiking, history, fire ecology, and geology of the Middle Fork canyon. 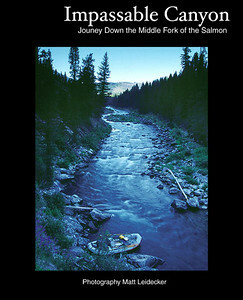 Buy the Middle Fork Guidebook online. was published in 2008. After the successful debut of the Middle Fork Guidebook in 2006, Matt began to research his next project. He had heard quite a bit about the Rogue River from the Oregon drift boat crews on the Middle Fork. The 40-mile Wild and Scenic stretch on the Rogue River was a popular whitewater run. During the summer and fall of 2007 Matt took several research trips down the Rogue River. The Rogue guide in in its second edition (2015). Like the Middle Fork of the Salmon guide, it contains comprehensive information on the rapids, camps, hiking, history and geology of the canyon. Unlike any other Rogue guidebooks, it covers the entire river from the headwaters on the flanks of Crater Lake to the Pacific Ocean at Gold Beach. 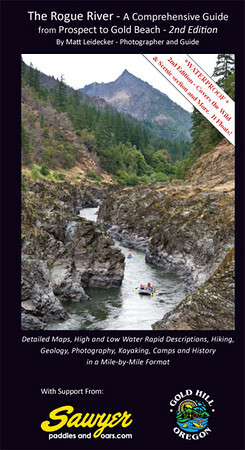 Buy the Rogue River Guidebook online. After successfully publishing two river guidebooks, Matt began to think about tackling a hiking guidebook. His daughter Sarah was born in 2007 while preparing to research the Rogue Guidebook. With another child (Max born in 2009) on the way, Matt wanted to stay closer to home. Being the map-geek that he is, Matt really enjoyed having a waterproof book full of beautiful 7.5-minute topo maps. They were extreme handy for exploring the ridges of the Middle Fork, so why not apply the same durable, waterproof format to the mountains around his hometown of Sun Valley, ID? 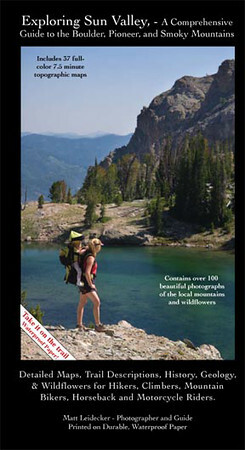 Exploring Sun Valley is the most comprehensive guidebook this central Idaho resort community. The guide covers every road and trail in Big Wood River drainage. Like the river guides, comprehensive information about the history, geology, flowers, and off-trail routes is also included. Buy Exploring Sun Valley online. When Matt was writing his popular guidebook to the Sun Valley area, he intentionally stopped the coverage at Galena Summit. Not only was this a logical stopping point, but it left open the possibility of an additional guidebook north of the summit. With the opportunity to hike or bike the more than 600 miles of trails in the Sawtooth Mountains, Matt’s wife Christine readily agreed to the project. In 2011, they purchased a used motorhome and headed north with Sarah (4) and Max (2) in tow. While one parent did the research, the other played with the kids. The motorhome provided the needed flexibility to move around the periphery of the mountains and hike the trails in the most efficient manner possible. The result, again, is the most comprehensive collection of information about the Sawtooth range. 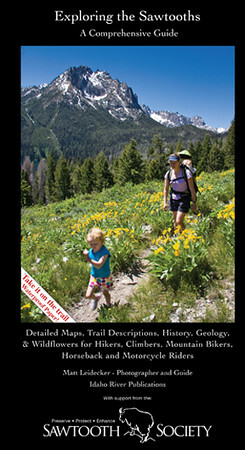 Covering every trail and road in the Sawtooths, the guidebook also included valuable climbing and wildflower information, as well as sections on the regional history and geology. Buy Exploring the Sawtooths online.